Thank you for your warm and supportive comments when I shared the meaning of this quilt journey earlier this month. It’s a privilege to share my heart among friends. 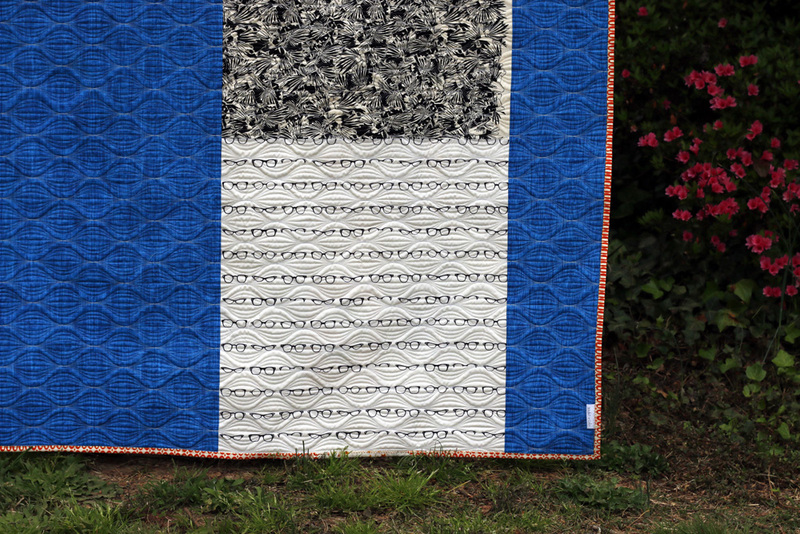 Since I’ve already put all that out there, we can focus on the yummy quilty details today. I think this is my favorite corner of the quilt. I like the improv style of these opening words and the way I was able to work even triangular letter scraps into the background. Wondering how I made these letters? They were all improv-pieced, ruler-free based on curve sewing skills. I decided early on that I would make the letters “S”, “W” and “N” in a graphic, blocky style. The rest unfolded from there. 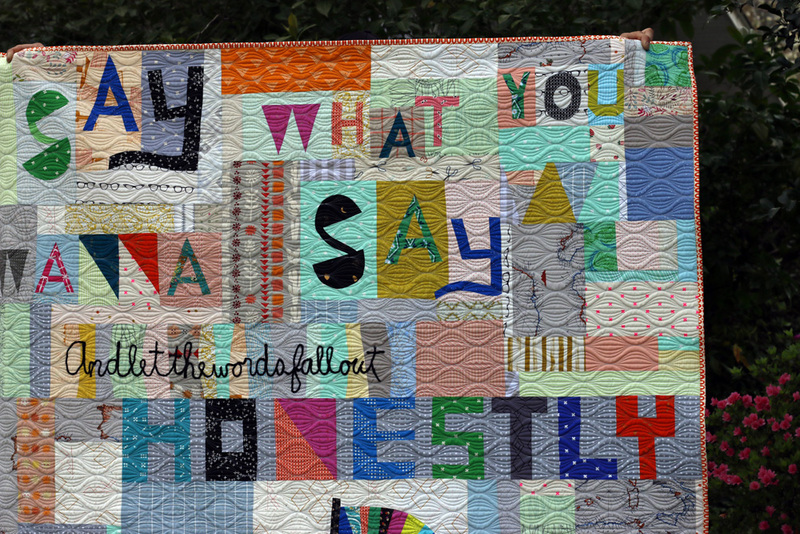 I think it was effective to use the word “honestly” to break up the playful energy of the quilt with something more uniform and tidy. Honesty is central, so I like that it reads with strength. Check out Crosscut’s Deal of the Week - 20% off all knit fabric! Use code 8PDH2 through 3/30/19 on your favorite knits. Two phrases were created with black yarn couched onto pieced backgrounds. This technique is really, super easy. I glue based the yarn into place and then zigzag stitched to secure with black thread. I thought cursive was perfect for the less-important words and it certainly saved time and space! I’m happy to report that quilting over it was completely issue-free. And speaking of quilting, do you like? I do! 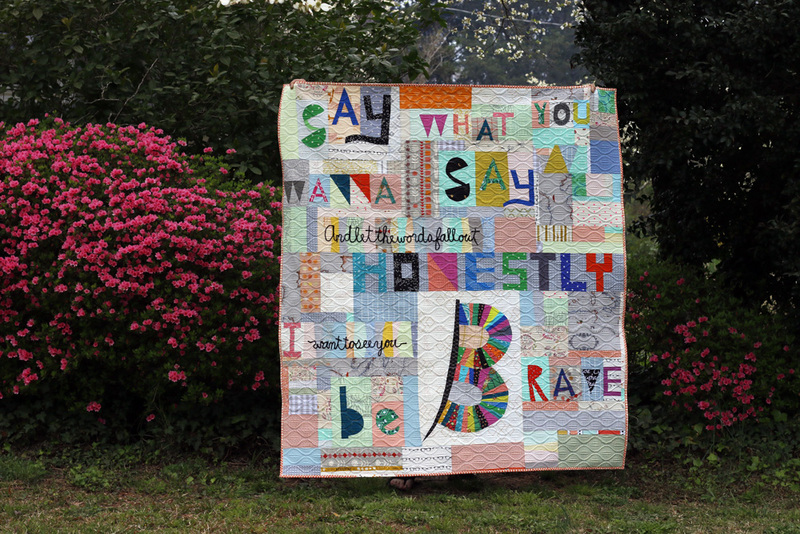 I wanted something that felt wild and fun, like the bright and upbeat fabrics I used for the quilt top. This is Crystal Ball quilting with a bit of extra length to make the “balls” ovals. 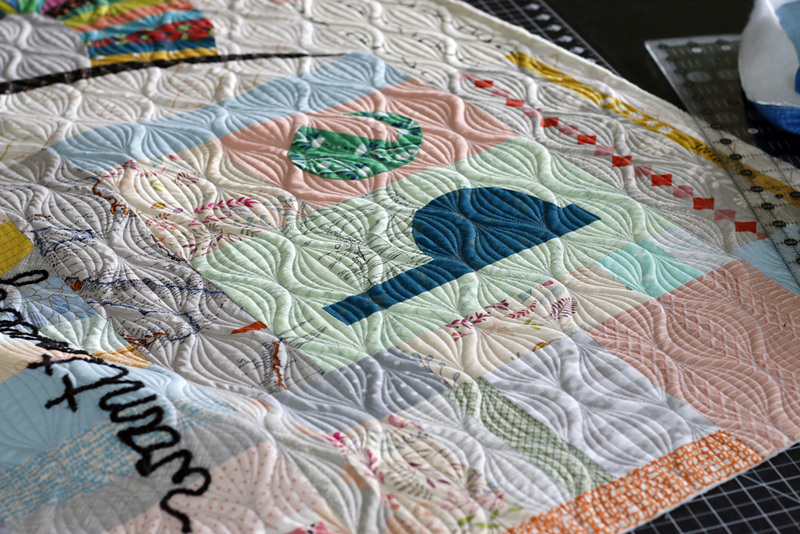 It has tons of energy, a tactile texture and provides lots of quilting to make sure this quilt lasts. I wanted to carry the energy of the quilt onto the back with bright colors and lots of contrast. For the backing, I used leftover wide-back scraps in blue from Pineapple Fabrics and a few black/white prints. This glasses print is super special. If you look, you’ll find snippets of it on the front too. This print was given to me by a friend who opened her home to us multiple times when Eleni had therapy in Chicago. The glasses reminded her of Eleni's black therapy frames. I’ve been holding onto it as it says “Eleni” to me. So, why use it now? 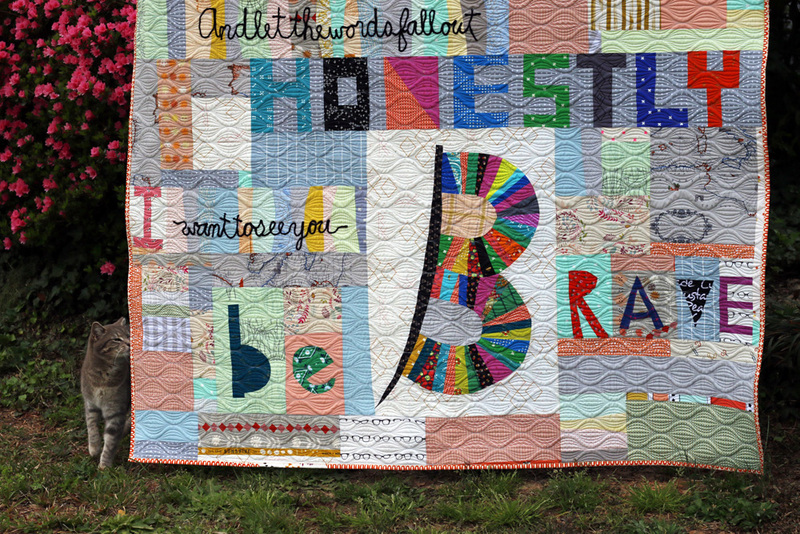 Well, my Brave quilt is a gift for my friend Bethany who has been living out her brave in the last few years, embracing big changes and becoming more and more free. Bethany will appreciate the reference to Eleni, whom she knew well. With her nursing skills, Bethany was able to watch Eleni on occasion and to understand the gravity of her medical challenges. Most precious to me, Bethany chose to be present when Eleni died. I will never forget how she helped us all that night. I also included this Cartogrape fabric all over the quilt top. It’s a little reference to my brave - our move to Europe. Or, our attempt to move to Europe, as it currently stands. We’re still trying and hoping and being brave most days. Completing this project is another step forward. I am grateful for the inspiration of Sara’s song and to be in a place where I have the time, materials and skills to bring it to life in a way that is meaningful. 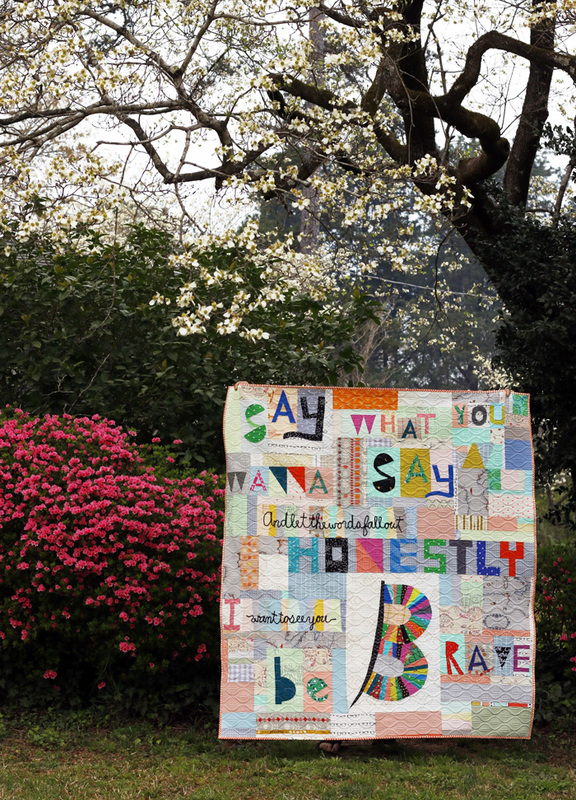 When I make a quilt like this, I become more free to be myself. I choose to put myself out there in a tangible way. It takes courage to even try to make something that embodies strong feelings like those that were stirred in me by Sara’s song. If you’re thinking about doing something similar, I want to encourage you. No matter what the outcome, there is value in trying, in working through the ideas and the fears and the frustration to make something true.